Glaciers in the Himalaya are receding faster than in any other part of the world (see Table 10.9) and, if the present rate continues, the likelihood of them disappearing by the year 2035 and perhaps sooner is very high if the Earth keeps warming at the current rate. Its total area will likely shrink from the present 500,000 to 100,000 km² by the year 2035 (WWF, 2005). We will show that such claims as these were known to be arrant nonsense as far back in 2004. But first we fast forward to the end of 2009 when the Indian Government Ministry for Environment and Forests (MoEF) put out a discussion paper written by V.K. Raina, former Deputy Director General of the Geological Survey of India, looking at 150 years’ worth of data gathered from the Geological Survey from 25 glaciers. Entitled Himalayan Glaciers: A State-of-Art Review of Glacial Studies, Glacial Retreat and Climate Change, the report described the claims made by the IPCC as “imaginative”, and gave a comprehensive picture of what was actually occurring with the Himalayan glaciers. R.K. Pachauri blasted the report, saying it was “extremely arrogant”, “schoolboy science”, “totally unsubstantiated” and “Voodoo science”. Such outbursts betray the desperate notes of someone who has something to hide – an agenda that is starting to unravel. As it now turns out, all these epithets look much more appropriate for the IPCC AR4 report, except for the “schoolboy science” remark, since even a schoolboy wouldn’t make as many foolish errors as the IPCC report has. Dr Pachauri also said he did not learn about the mistakes until they were reported in the media about 10 days ago, at which time he contacted other IPCC members. He denied keeping quiet about the errors to avoid disrupting the UN summit on climate change in Copenhagen, or discouraging funding for TERI’s own glacier programme. Rajendra Pachauri, who heads the Inter-governmental Panel on Climate Change (IPCC), on Friday said the chances of the U.N. panel having made more errors in its benchmark 2007 report were “minimal if not non-existent”, while again admitting the “regrettable error” that has raised questions about its credibility. But he admitted that there may have been other errors in the same section of the report, and said that he was considering whether to take action against those responsible. Predictions of scientific merit…very robust…universally acknowledged, my foot. Pachauri knew enough then to know that those statements were untrue. Let us see how the web of lies in IPCC AR4 was spun. I will emphasize certain text in italics. With the further progress of warming or stabilization of the present climate…The degradation of the extrapolar glaciation of the Earth will be apparent in rising ocean level already by the year 2050, and there will be a drastic rise of the ocean thereafter caused by the deglaciation-derived runoff (see Table 11 ). This period will last from 200 to 300 years. The extrapolar glaciation of the Earth will be decaying at rapid, catastrophic rates—its total area will shrink from 500,000 to 100,000 km² by the year 2350. Glaciers will survive only in the mountains of inner Alaska, on some Arctic archipelagos, within Patagonian ice sheets, in the Karakoram Mountains, in the Himalayas, in some regions of Tibet and on the highest mountain peaks in the temperature [temperate?] latitudes. Note that 500, 000 km² is the total area of ALL extrapolar glaciers throughout the world. With unabated global warming, shrinkage to 100,000 km² takes place by 2350 (not 2035), and even then glaciers will survive in the Himalayas. The prediction that “glaciers in the region will vanish within 40 years as a result of global warming” and that the flow of Himalayan rivers will “eventually diminish, resulting in widespread water shortages” (New Scientist 1999; 1999, 2003) is equally disturbing. The Times of London (21 July 2003), reporting on an international meeting held at the University of Birmingham, noted that ‘Himalayan glaciers could vanish within 40 years because of global warming . . . 500 million people in countries like India could also be at increased risk of drought and starvation.’ Syed Hasnain is quoted as affirming that ‘the glaciers of the region [Central Indian Himalaya] could be gone by 2035’. However, most interestingly, the above quote comes from a withering attack and exposure by Professor Jack D. Ives of the false claims attributed to Hasnain about the Himalayan glaciers. Who is Jack Ives? Jack Ives is a foremost expert on mountains, especially the Himalayas. As Professor Emeritus, Environmental Science, University of California and Davis Honorary Research Professor, Carleton University, Ottawa, Ives is no obscure scientist, but a towering figure in the field. No-one researching Himalayan mountains could fail to know of Jack Ives, his extensive research, and exceptional achievements. Here are a few details to fill in the picture. Ives has over 180 publications, scientific papers, and books to his credit, and was Founder and Editor (1968-1980) of Arctic and Alpine Research journal, and Founder and Editor (1980-2000) of Mountain Research and Development journal. Very many photos of the Himalayas in the literature trace their origin to Jack Ives. Jack Ives’ earliest interests involved glaciology and the physical aspects of mountains and the Arctic. In 1973, UNESCO invited him under the Man and the Biosphere programme to work with an international team of academics. In 1978, he was appointed coordinator of United Nations University’s mountain research project. Jack Ives’ numerous scholarly papers and books, in particular his founding editorship of the journal Mountain Research and Development (1981–2000) reveal his impressive expertise and tireless efforts to enhance the knowledge and vision of students, scientists, and political leaders. The book Mountains of the World: A Global Priority, edited by Bruno Messerli and Jack Ives and intended for the eyes of the UN General Assembly, met with world-wide approval. Jack Ives notes that his award is virtually identical to that received by Bruno Messerli—a reflection of their 25-year collaboration as codirectors of the United Nations University’s Mountain Programme, and of their contribution to the initiation of Mountain Agenda and Chapter 13 of Agenda 21 at the Rio Earth Summit. The work Himalayan Perceptions was described by Kumar Mainali, Editor of the Himalayan Journal of Sciences, as “probably the single most influential monograph ever published on Himalayan environmental issues” (INASP Newsletter, Spring 2006). The section in both editions entitled Some current myths on a Himalayan scale was largely reproduced in the paper published in the peer-reviewed Himalayan Journal of Sciences 2005, and because of its relevance will be quoted at length below. The title of the paper is Himalayan misconceptions and distortions: What are the facts? Himalayan Delusions: Who’s kidding who and why — Science at the service of media, politics and the development agencies. This whole paper is well worth a read. It is a devastating exposure. …The Times of London (21 July 2003), reporting on an international meeting held at the University of Birmingham, noted that ‘Himalayan glaciers could vanish within 40 years because of global warming . . . 500 million people in countries like India could also be at increased risk of drought and starvation.’ Syed Hasnain is quoted as affirming that ‘the glaciers of the region [Central Indian Himalaya] could be gone by 2035’. According to Barry (1992: 45) the average temperature decrease with height (environmental lapse rate) is about 6ºC/km in the free atmosphere. The dry adiabatic lapse rate (DALR) is 9.8ºC/km. If it is assumed that the equilibrium line altitude (comparable with the ‘snow line’) in the Central Himalaya is about 5,000 masl and it will need to rise above 7,000 m if all the glaciers are to be eliminated, then the mean temperature increase needed to effect this change would be about 12–18ºC. Given that degree of global warming, summers in Calcutta would be a little uncomfortable. As indicated earlier, myths tend to be self-perpetuating. In practice their longevity is often encouraged by vested interests of one form or another. This, by one of the most well-known experts in the field, is a direct attack on the lies being propagated, and the prostitution and corruption of science in “the service of media, politics and the development agencies”. It is simply not possible after 2004 to suggest that the UN and those studying the Himalayas were unaware of the exposure of the myth and scam by such a prominent person as Jack Ives. Moreover, WWF were fully cognizant of Ives and his works – after all, in 2005 they quoted from four of his works in their paper: Ives, J. and Barry, R.(eds. ), Arctic and Alpine Environments; Ives, J. D. (1986). Glacial lake outburst floods and risk engineering in the Himalaya; Ives, J. D., and Messerli, B. (1989). “The Himalayan Dilemma” and Messerli, B. and Ives, J.D. (Eds. ), (1997). Mountains of the World – A Global Priority. A contribution to Chapter 13 of Agenda 21. The silliness of writing that all the Himalayan glaciers could melt by 2035 should be self-evident: it would likely cause an undergraduate in physical geography or geology to laugh. Well, that was 2004. It was to be expected, of course, that exposure of the lies and myths would scotch them, except perhaps among advocacy groups. In spite of Ives’ superb work, he and the United Nations University could not have expected that any respectable scientific body would deliberately perpetuate and embellish the myths he had slain and foist them onto an unsuspecting, and generally trusting public. In embodying these lies, the IPCC has behaved in a disgracefully cynical and evil manner with a public who could reasonably expect better. So there you have it. This dead fish rotting from the head ensured that the lie was propagated and cemented into AR4 in 2007, years after it had been exposed in the relevant peer-reviewed literature as a lie. Thanks for this. It is far greater level of evil to wilfully ignore previous scientific refutation than it is to include speculative advocacy without proper peer review. This claim re glaciers became a signature claim for warmanistas, an emotional touchstone if you will, and so trying to say, as they have, that it was a simple error on one page of 1600,is a total collapse of any last shred of integrity. Add the lies about the Amazon ( “40% at risk of small decrease in precipitation”) and about a proven link between warming and extreme events, to all the other stuff and they should be hanging their heads in shame! I suspect that the veracity of any IPCC claim is inversely proportionate to the extent to which it is defended by its proponents. Whether by accident, or by design, this Pachauri polluted process – aided and abetted by co-opted (so-called) science journalists – has, until now, resulted in the creation of a horrendous myth of infallibility surrounding the IPCC. In light of your excellent exposé on this particular issue, it is quite telling that the gist of the “Copenhagen Diagnosis” [introduced with much – perhaps now forgotten! – fanfare as an “update” to the Fourth Assessment Report] is that “everything’s happening much faster than we previously thought … so we must act now”. If you’re interested in seeing how this ethically-challenged organization conducts its “rigorous” review process, you might be interested in taking a look at an analysis I did of one Lead Author’s responses to the Reviewer comments in Chapter 6 of the Fourth Assessment Report … in particular, responses to the paragraph on the infamous “hockey stick”. Aaah these indiscretions by the UNIPCC are just the tip of the iceberg. The whole global warming scare is melting faster than kool aid! The latter part of the discourse “UN IPCC Rotting from the Head down” devotes a surprising amount of text to my supposedly being “a towering figure in the field.” My response is prompted by the need for some explanation and correction. I cannot agree that either Dr. Hasnain or Dr. Pachauri must NECESSARILY have had access to my earlier publications. My primary contention in writing the sections that were quoted was that scholars, such as Dr. Hasnain, WERE REPORTED to have made doomsday-like predictions. It appears that he has denied responsibility for such remarks, claiming that he was misquoted. There are several similar and related remarks in the news media. For instance, Fred Pearce quoted Dr. John Reynolds (New Scientist, 2002 –MELTDOWN) to the effect that “ . . . the 21st century could see hundreds of millions dead. . .” due to the outbreak of glacial lakes in the Himalaya and Andes. I understand that Dr. Reynolds claimed that he had been misquoted. Another example should suffice. I came across two inflammatory reports as far back as 1999 that threatened “… an enormous disaster waiting to happen … Five million people could die …” when Lake Sarez in the Tajikistan Pamir Mountains breaks through its landslide dam and “… blast[s] a trail of destruction a thousand miles…” downstream (Pearce, 19th June, 1999, NEW SCIENTIST; Burke, 20th June, 1999, THE OBSERVER). These reports were published a few days before the investigating team of geophysicists, engineers, geologists, and geographers returned from Lake Sarez and held a press conference in Geneva. The 20-plus journalists who attended all accepted the team’s findings – that the risk of catastrophic outburst was minimal. The silliness of writing that all the Himalayan glaciers could melt by 2035 should be self-evident: it would likely cause an undergraduate in physical geography or geology to laugh. Do not journalists have an obligation to check their STORIES, especially when they may have an impact on the lives of a large number of innocent people? Today, many journalists appear to have unlimited license. One small correction. I was NOT the UN’s chief spokesperson on the occasion (November 2001) when the International Year of Mountains (2002) was announced at UN headquarters in New York. The chief spokesperson was the Secretary-General of UNESCO. I had been asked to represent Prof. Dr. Hans van Ginkel, Rector of United Nations University, who was unable to attend. While I deplore the inclusion of the infamous prediction, 2035, and related errors in the IPCC (2007) report, it is regrettable that they have been used in an attempt to damage so much outstanding work. For the record, I have never been a member of an IPCC panel; I have not even known the names of any panel members until recently. Nor is it surprising to me that I was not invited to participate. The “paper trail”, however, remains incompletely traced. But we must also be cautious of the dangers of mischievous journalism. Many thanks for your insightful comments. I have emended the post accordingly. With respect to Pachauri and Hasnain’s foreknowledge that the 2035 date in the IPCC AR4 report was grossly inaccurate we need to make the following comments. Hasnain himself has admitted that he was aware of the 2035 date being attributed to him on several occasions, but he never sought to correct the error, if indeed his comments were misreported. Moreover, Hasnain was hand picked by Pachauri to head up his Glaciology team at TERI. If Hasnain knew that the 2035 date or the suggestions that the glaciers would disappear in a few decades were wrong, why did they appear in TERI’s applications for grant funding which Hasnain must have had a hand in? As we pointed out in the post above, the lie even appeared in a TERI press release of January 15, 2010 about a meeting that both Hasnain and Pachauri attended AFTER the myth of the imminent disappearance of the glaciers had been widely scotched. It suited Hasnain and Pachauri to perpetuate a lie in order to obtain funding. Thank you for starting this discussion and for enabling Prof Ives to add to this discussion. You can read it for yourself, but in my opinion it looks like something put together by some rather weak undergraduates rather than the product of 28 presentations from experts in Himalayan glaciers and precipitation. It is full of inconsistencies. It acknowledges that the original statements concerning the melting of the glaciers were grossly inaccurate but then proceeds to a set of conclusions that only make sense if the original statements were in fact true. The bibliography is even more troubling with book reviews being cited as evidence, along with unpublished and unreferenced studies. Prof. Ives work is not cited. It would be interesting to get Prof Ives expert opinion on both the UNEP report and Prof. Boulton’s comments concerning the Himalayan glaciers. In the mean time I am still looking for some reliable data on discharge rates. For years, Ives has been warning that the habit of distortion and exaggeration was undermining both science and development. In Himalayan Dilemma: Reconciling Development and Conservation (1989) Ives took aim at the so-called Theory of Himalayan Environmental Degradation, a popular construct that supported projections of catastrophic deforestation. More recently, particularly in Himalayan Perceptions: Environmental Change and the Well-being of Mountain Peoples (2004), he has urged caution on the subject of Glacial Lake Outburst Floods (GLOFs). Ives has not denied that deforestation, GLOFs, and glacial thinning are problems. He has simply argued that in many cases there is insufficient evidence to establish causalities and projections, and that the misidentification of a crisis or a pseudo-crisis as a supercrisis not only wastes limited resources but also undermines the credibility of science in general. And, coincidentally, Ives has repeatedly singled out Fred Pearce of the New Scientist as a purveyor of unsubstantiated mega-disaster scenarios. There have been numerous articles on the subject, both in mainstream media (including BBC and The Times), as well as the blogosphere (notably, right-wing hatcheteers such as Buy The Truth and Skeptics Corner)…while it is flattering to have a lot of bloggers fluffing up the reputation of our little journal and of our friend Jack Ives, we’ve got to keep in mind that the fluffers are basically the same crew as the tea-baggers, creationists, and corporate tools. Indeed, and I’m glad to be the one that brought it to the attention of the interested public, and that there are now lawsuits against the EPA. That’s because, as a scientist myself, I’m interested in truthfulness and openness, not the occult and cabals. Since Seth Sicroff knew about the error in the IPCC AR4 report, why did he not expose it years ago? Why did it have to wait until a supposedly nasty right wing, fundamentalist, oil shill fascist investigated the truth and exposed it? How many more years would have gone by if I hadn’t exposed this, and some of the other issues on this blog? I think you meant Venice not Florence. Ironically, the scale of change that would cause glacial meltdown in the Himalayas would most likely be great enough to bring on a cascade of unpleasant intermediary developments well before the disappearance of Himalayan glaciers. Ocean waters would rise enough to wipe out Bangladesh, for instance. Of course, UNESCO would have other fish to fry at that point: Florence, the Everglades, and quite a few other World Heritage Sites would be in the drink. Although Florence has been flooded by the river Arno, it is 100km inland and at 50m elevation, so that would be some sea level rise to put Florence in the drink. yes, of course, I meant Venice rather than Florence. I’ve changed the text at WanderingEducators.com. Interesting stuff. The only thing I really have to add is that it is a mockery of scientists and science itself to call Pachauri a scientist. referring to the article in which Pachauri refuses to answer the reporters question. 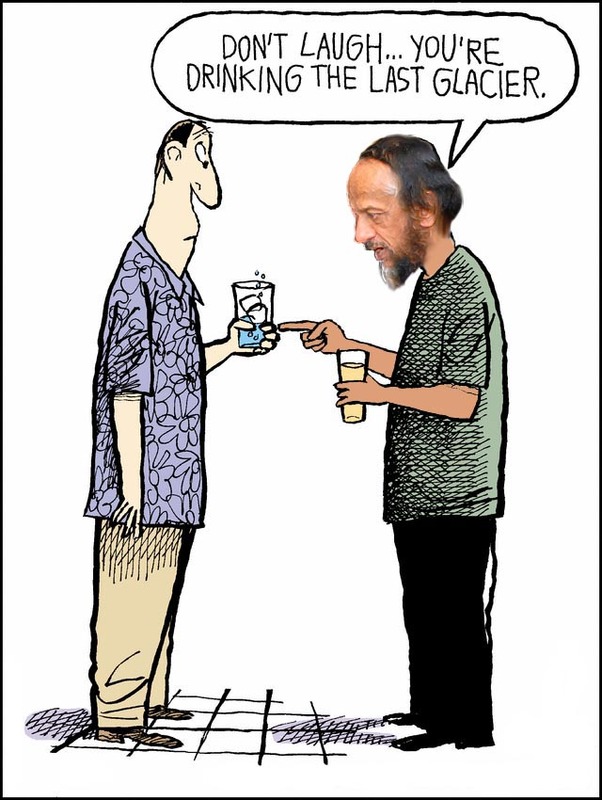 Pachauri is no scientist. He is a former railroad engineer who was handpicked for this position because of his political ties and his PHD was an honorary one, not deserved or worked for. Josh done me a cool T- shirt with his priceless ‘Greenpeace in our time’ cartoon. Now I’m thinking of getting more done, to give to all my environmentalist friends. It’s great how that image can be read both ways. On the face of it supporting an Eco friendly world, which I’m all in favour off btw. , but with the underlying message that only those with a deeper historical perspective will get. I don’t know where Josh gets his talent from , but I think this piece is worthy of even that great Czech tradition, for cartooning under oppression. Indeed it’s frightening to think, that in the Czechoslovakia of those times , one would have been thrown in jail for less than this. I have been stating many of the observations as quoted above for several years . It is quite infuriating to listen and read of the many lies being spread by self professed scientists . The belching chimneys of coal burning and nuclear factories lead those who have been brainwashed into the global warming religeon that these factories belch carbon dioxide is entirely false . Over 90% of what you see is water vapour . You have been lied to and misled . There is no global warming ! We have a natural variation taking place which many , otherwise sensible people have mistaken for an aberation . the only aberation is in their minds .